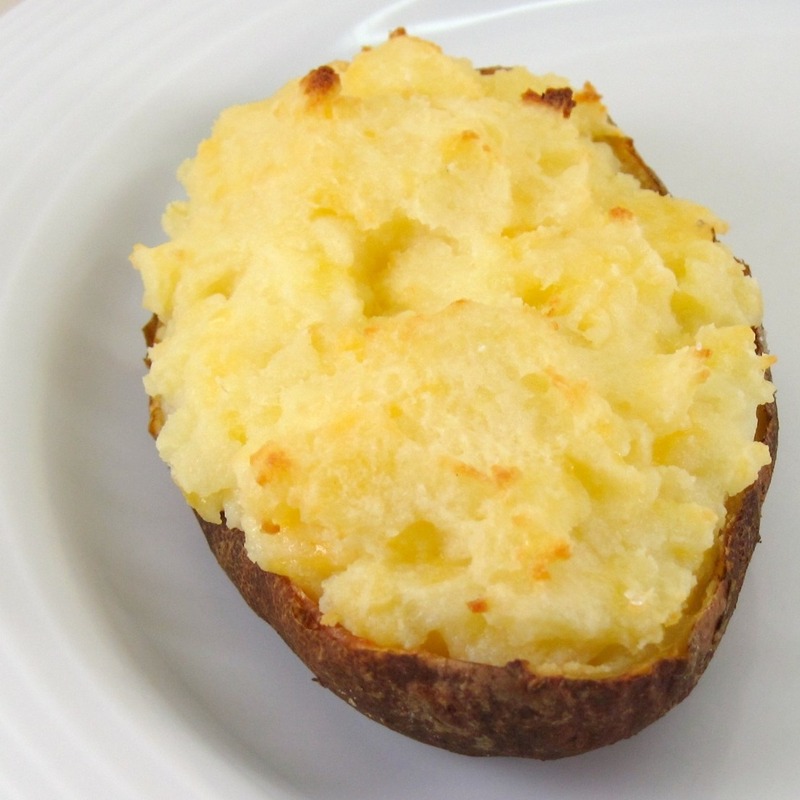 Twice Baked Potatoes are basically cheesy mashed potatoes baked in potato skins. I used a sharp cheddar to get more of a flavor bang from just 2 ounces, but you could really use any type of cheese that you like. I often use medium cheddar. As I’m writing this, I’m thinking blue cheese would probably be amazing! 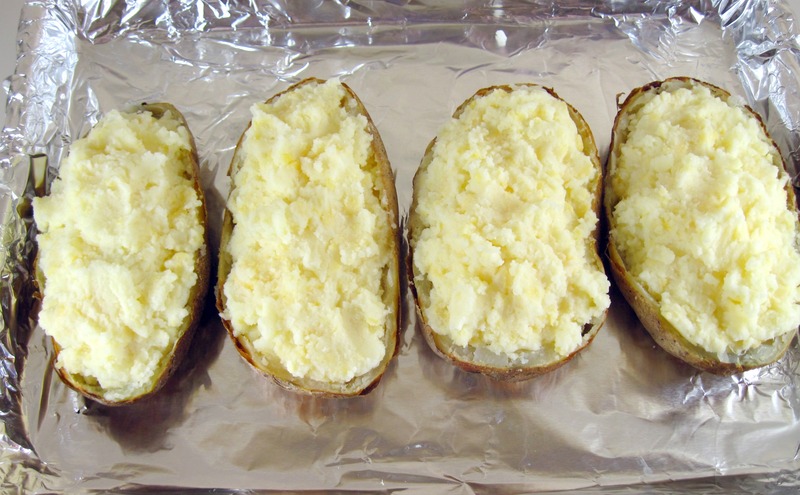 This “recipe” for Twice Baked Potatoes will give you the basic info about how to make them. If you don’t have sour cream, just use more milk. You can add more cheese or butter for a more decadent version. I mix the cheese into the potatoes, but you could top the potatoes with some grated cheese, too. Twice Baked Potatoes take a bit of time, but they are really easy to make and a perfect fall comfort food! 3. Put the potatoes directly on the oven rack and bake for 1 hour. 4. 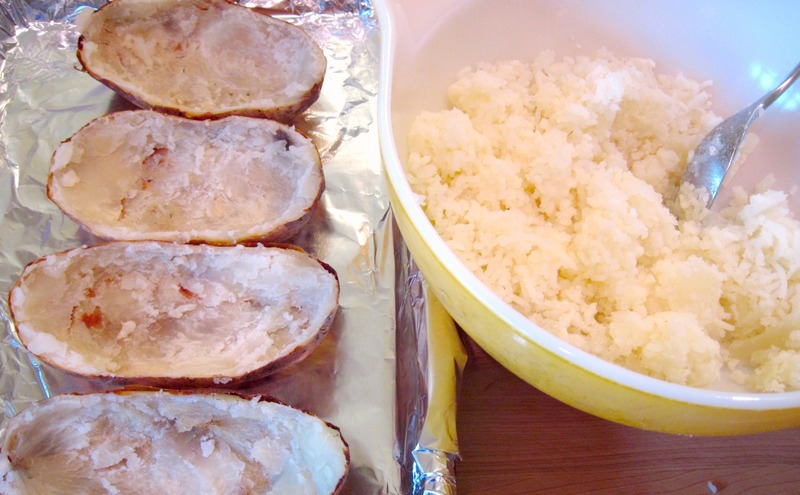 Remove the potatoes from the oven and lower the heat in the oven to 350˚. 5. Let the potatoes cool for a few minutes so they’re not too hot to handle. Slice them in half lengthwise and scoop out the potato. 7. Mix the sour cream, butter, cheese, milk, and salt into the potatoes. 8. Fill the potato skins with the potato mixture. I love your comment! That is so sweet, and your nana would love it if you made it for her! 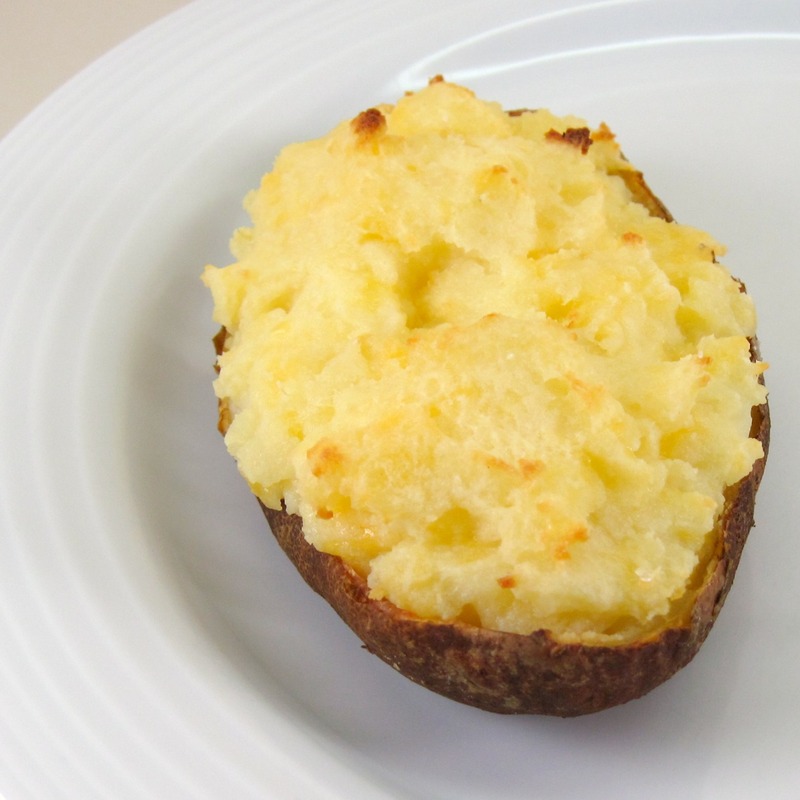 I love making twice baked potatoes with sour cream…these are a favorite year round at my house 🙂 Yours look wonderful! I’d love to hear how they turn out with another type of potatoes. I’m sure it would be great! Great Looking Twice Bakes. I used to make these Constantly fresh when I worked for Outback Steakhouse. You probably added more cheese, sour cream, etc. for the restaurant version to make them especially rich and delicious! You’re so right…this is a great make-ahead recipe! I’ve tripled or quadrupled the recipe and made it ahead for entertaining. I just fill the shells, cover with plastic wrap, and refrigerate until I’m ready for the final second baking. These look great! I’m slow smoking two whole chickens today. These potatoes will be a great accompaniment. The potatoes would be great with your slow-smoked chickens, Curt! I’m not very good about writing down recipes but I’m trying to get better. Twice baked potatoes are a favorite in our house. I make them to use up the odds and ends hanging out in the fridge. That’s a great idea! You really can use your imagination with the recipe. These are my girls favorites, I think blue cheese would be divine. Thanks for all your support, I’m going to try and keep up as much as possible. Hope you have a great week. Great to hear from you, Gina! Thanks for your comment. You think blue cheese sounds good, too, huh? I really have to try that some time! I remember eating tasty little twiced baked taters with (usually overcooked) beef in first-class on a now historical airline. Yours look so much better Kath. I’m drooling. Thank you for sharing your comfort treat. I love twice baked potatoes. I’m eating a boring egg sandwich and wishing I had THIS to munch on. I hope you have a beautfiul day and weekend. We’re getting close! Much love from Austin. Thanks for your comment, Monet! I think an egg sandwich would be heavenly using one of your gorgeous breads, lightly toasted! I like this..bored of eating mashed potatoes..and thanks for reaching out on Twitter! It is kind of an upscale take on mashed potatoes, isn’t it? Thanks for stopping by!